Have an issue you can't figure out on your own? I tired to follow several guides and read the (minimal) documentation of the board, but I can't get them to work. Console is telling me drivers are overheating the second I start the printer up. X axis drives fine most of the time but it feels like it is week. I can move the Y axis forward and backward but when I give it a home command it can't move unless I give it a push. Z axis moves only downward but can't go up without a push. Extruder doesn't work at all, doesn't even make a sound. I feel like the the serial bus is not working correctly and the board can't configure the drivers to have the desired output current ? Can anyone help please ? My first guess is that your currents may not be set optimally for the drivers. Try "M906 X700 Y700 Z700 E700" to set the mA for all four drivers. THEN, reset the EEPROM with "M500". For some reason, Marlin has difficulty setting those values after flashing the firmware. Adjust the "700" value as low as possible to keep the temperatures down. They run hot at 12V, but it is possible. Heatsinks are an absolute must on these things. Ultimately, I had to put in a cooling fan, too. For testing purposes, I'd recommend keeping the board exposed and cooled. Get the currents set so the steppers behave properly, then deal with the cooling. Is this normal behavior ? A value like "0xFF:FF:FF:FF" suggests a connection issue. Look at wiring, solder, etc. Thank you for the continuous help I appreciate it sorry I am not able to reply quickly because I am working all day long. I checked the wiring quickly they seem to be ok. I am not able to execute "M500" I the EEPROM is disabled in the marlin configuration. I will fix it today and recheck the wiring before I get back to you with the updates. Btw, do you think that it isn't a wiring problem but maybe the default pins are not functioning correctly for the bus because they are configured for the LCD or something ? I tried to disable everything that has to do with the LCD and SSD but maybe I missed something..
READ: Error:Printer halted. kill() called! 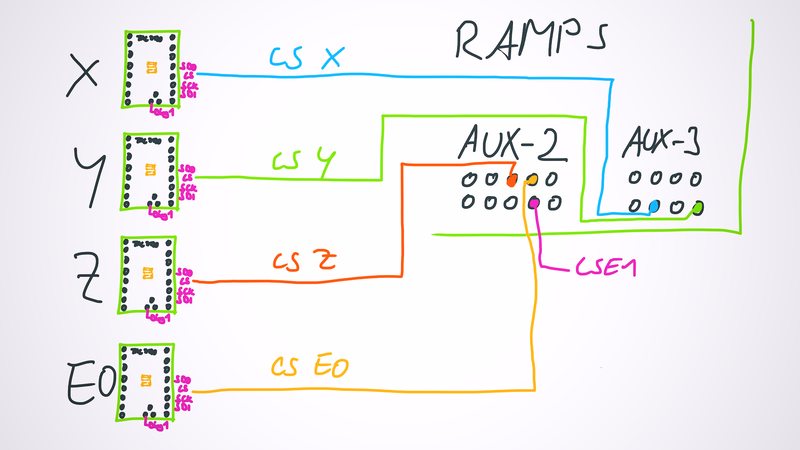 Here is a video that does a great step-by-step for the RAMPS 1.4 and TMC2130s by Alex Kenis. This is getting ridiculous, I re-checked everything for a short circuit or a bad connection and I am not an idiot I work with robotics and embedded systems a lot I know what I am doing but everything seems fine. I bought some new DRV8825 (only ones I could find) and installed them instead then changed the DRIVER_TYPE in the config file and restored the default pins but still nothing they are having the same issue: Steppers make a sound but they are too weak to do anything. I checked the input voltage and it is 24V as it should... At this point I am running out of ideas. Thank you for all the help guys specially Stefan, I feel stupid not being able to figure this out. Ok so there is 3 jumpers underneath each driver I previously had removed all of the for the 2130. I noticed that if I place them back the DRV8825 is there a certain configuration for the jumpers that might be preferable with the tmc2130 ? 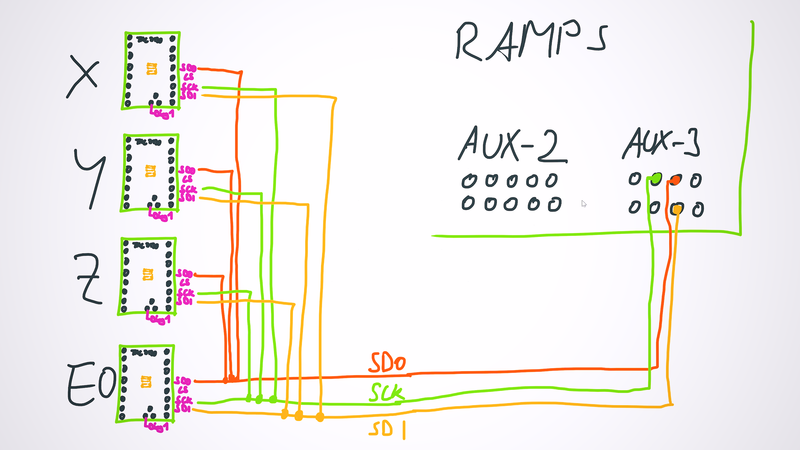 Those jumpers should be removed for the TMCs, though I think they do nothing when a TMC is connected (they alter the microstepping in conventional drivers). The ONE reason I prefer the RAMPS/Arduino combination over a MKS board is that each of those two pieces can be replaced individually for troubleshooting. (Ideally, we shouldn't have to worry about build quality, but in reality, I've thrown out a bunch of boards because they just didn't work.) We may be getting to that point. Just in case, make sure you've gone through both configuration files to disable the TMCs. Also, does the LCD light up if you connect the board to USB? I've scratch-built a few printers: each one was a rough journey through electronics.